NALP values and seeks a diverse leadership. NALP is an association which is led by its volunteers, who contribute significant time and energy to their leadership positions within NALP. A common refrain from current and past leaders is that they gained as much or more than they were able to give NALP during their time of leadership. The NALP Network — The relationships that develop among Officers, Directors and other NALP leaders and members creates an extensive network that provides access to candid advice and information on any number of issues, whether it be an unusual student advising issue, a difficult situation with a search firm, information about a particular geographic market, or information about a firm's reputation on-campus. 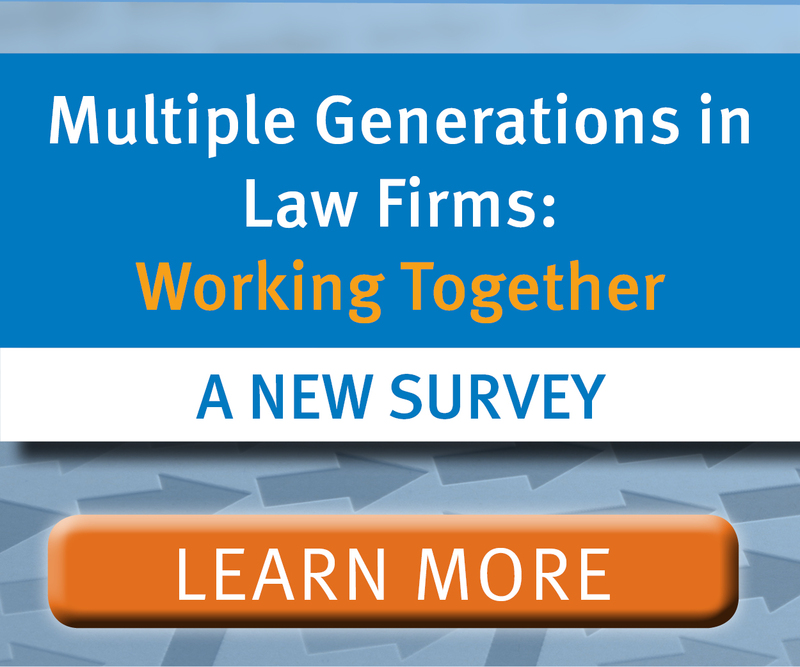 Knowledge of Industry Trends — NALP leaders gain ready access to information on trends in the broader legal recruiting field and related industries, and the opportunity to be regularly informed on these trends. NALP leaders are provided this information affirmatively and regularly through reports based on outreach to members; committee and section reports; and regular environmental scanning of relevant articles. Some additional benefits of NALP leadership to the volunteer and his or her employer, by specific position, are documented below. The NALP membership, including virtually all ABA-accredited law schools, and over 1,000 employer members. In addition to appearing in person before the membership at NALP programs, the President writes a monthly column for the NALP Bulletin. Senior leaders of allied associations including the American Bar Association Section of Legal Education and Admissions to the Bar, the American Association of Law Schools, and the Law School Admissions Council. Hiring Partners, Deans, lawyers and legal administrators who attend NALP programs such as the annual Diversity and Inclusion Summit and the Professional Development Institute. Regional and national media outlets including The National Law Journal and American Lawyer. Strategic Planning — Develops the annual business plan for the Association based on its strategic plan. Appoints leaders of all Sections, Committees, Work Groups and Task Forces to advance the work of the Association. Participates in the Annual Education Conference planning process as well as the planning and execution of other educational programs. Leadership — Serves as chief volunteer officer of the Association. Plans and leads two-day quarterly meetings of the thirteen-member Board of Directors. 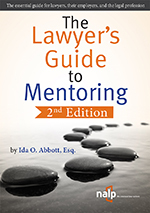 Works with and provides guidance and direction to NALP volunteers. Formal Training — Attends professional association leadership training conference with Executive Director. President attends any NALP educational program at NALP's expense. Public speaking — Appears regularly before all the audiences noted above. Writing — Writes a regular column for the NALP Bulletin and commentary for any affiliated organization as appropriate. Media — With the Executive Director, speaks for the Association to media. The President's employer is entitled to reimbursement of up to $30,000 over the term of office for resources expended and expenses incurred in supporting the President in the duties as President and President-Elect of NALP. The President will have discretion to budget the funds as will best support the duties to NALP. No more than one half of the total amount can be used in the President-Elect year. The President's registration fee to attend NALP's Annual Education Conference is waived in perpetuity. The President may call upon the NALP staff for support in carrying out the duties of the NALP President as needed - from administrative assistance to support in developing the business plan. The President is encouraged to call upon other Officers and Board members for assistance in completing the tasks of the NALP President (e.g., attending external and internal events, writing for publication, identifying and managing volunteers, and special projects). Travel expenses associated with NALP Board meetings and any additional NALP-related required travel are reimbursable. The President is eligible for reimbursement of dependent care expenses (up to $1000/year) above any regularly anticipated cost of such expense incurred as a result of Board activities. The Vice-President for Member Services and Education and his or her employer receive significant recognition with the NALP membership. The Vice-President for Member Services and Education interacts with NALP members as the Chair of the Regional Resource Council and is a speaker at NALP's Annual Education Conference and at other NALP programs. Leadership — If the President is unavailable, the Vice-President for Member Services and Education takes on the duties of the President. The Vice-President for Member Services and Education also serves as a member of the Executive Committee of the NALP Board. Planning — Participates in the Annual Education Conference planning process as well as other educational program planning. Writing — Has opportunities to write for the NALP Bulletin and in publications of allied organizations. Public Speaking — Has opportunities to develop public speaking skills through presentations within NALP, the legal education community, and the broader legal community. The Vice-President for Member Services and Education's employer is entitled to reimbursement of up to $10,000 over the term of office for resources expended and expenses incurred in supporting the duties as a Vice-President of NALP. The Vice-President for Member Services and Education will have discretion to budget the funds as will best support the duties to NALP. No more than one half of the total amount can be used in the first year of the term. The Vice-President for Member Services and Education may call upon the NALP staff for support in carrying out the duties of the NALP Vice-President for Member Services and Education. The Vice-President for Member Services and Education is eligible for reimbursement of dependent care expenses (up to $1000/year) above any regularly anticipated cost of such expense incurred as a result of Board activities. Finance — Oversees the financial operations of the association, including reviewing and developing strategies to maximize the Association's financial health; and developing the association's $4.0+ million annual budget. Leadership — Serves as a member of the Executive Committee of NALP's Board and Chair of the Investment Oversight and Audit Committees. Writing — Writes for the NALP Bulletin and in publications of allied organizations. The Vice-President for Finance's employer is entitled to reimbursement of up to $10,000 over the term of office for resources expended and expenses incurred in supporting the duties as a Vice-President of NALP. The Vice-President for Finance will have discretion to budget the funds as will best support the duties to NALP. No more than one half of the total amount can be used in the first year of the term. The Vice-President for Finance may call upon the NALP staff for support in carrying out her/his duties. In particular the Vice-President for Finance may call upon the Executive Director, NALP's Finance Administrator, and NALP's outside investment advisor. The Vice-President for Finance is eligible for reimbursement of dependent care expenses (up to $1000/year) above any regularly anticipated cost of such expense incurred as a result of Board activities. The Vice-President for Finance is offered the option of attending a financial training program for financial officers of non-profit boards. Each Director develops strong professional relationships with a wide variety of NALP members, including fellow Board members, Sections and Committees to which the Director serves as liaison, and members with whom the Director conducts periodic outreach for feedback on a variety of issues. Directors regularly report that serving on NALP's Board has allowed them to develop relationships with their counterpart members on the school or employer side which have benefited both. For example, Directors employed by firms have been invited to speak at law schools, increasing their firm's name recognition and positive presence at the law school. 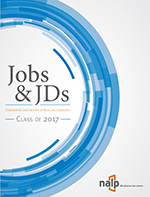 Directors employed by law schools have had employers decide to interview particular students or recruit on-campus as a result of the relationships developed through NALP leadership. Gains in-depth exposure to the governance and management of a national association. Participates in a formal two-day training program for board members. Has opportunities to write for the NALP Bulletin and in publications of allied organizations. Has opportunities to develop public speaking skills through presentations within NALP, the legal education community, and the broader legal community. Has opportunities to work with and provide guidance and direction to NALP Sections, Committees, Task Forces, Advisory Groups, and Working Groups. Board members are eligible for reimbursable travel expenses associated with NALP Board meetings and any additional NALP-related required travel. The registration fee to attend one of NALP's educational programming events (other than the Annual Education Conference) or NALP webinars is waived for each Director during each year of the term. Directors are eligible for reimbursement of dependent care expenses (up to $1000/year) above any regularly anticipated cost of such expense incurred as a result of Board activities. Ensure the future success of the organization by encouraging member participation in the nomination process, slating the Officers and Directors, and overseeing the election process. Have significant interaction with members in their region and nationally. Attend a one-day intensive orientation program, introducing them to the nomination process. Attend the annual slating meeting and engage in a collaborative group deliberation process culminating in the selection of the Board members. Participate in the Regional Business Meetings during the Annual Education Conference by introducing the winners of the regional election. Conduct outreach to and have significant interaction with members in their region to gather input for the Annual Education Conference planning meeting. Review proposals submitted and select programs for the Annual Education Conference. Attend the Annual Education Conference planning meeting (June 19-21, 2019, Montreal, Quebec, Canada). Brainstorm and develop original programming for the Annual Education Conference. Serve as primary contacts for conference speakers and as program shepherds during the conference. Participate in the Regional Business Meetings during the Annual Education Conference by welcoming members to the conference venue. Have their registration fee waived for the Annual Education Conference during their term of office (April 28 - May 1, 2020). Have the opportunity to write brief articles for the Bulletin publicizing the Annual Education Conference. Serve as members of the Regional Resource Council, with its opportunities to collaborate with colleagues from around the country to identify and serve member needs. Become experts in regional trends, markets, and issues through regular interaction with members throughout their region. Gain a deeper understanding of the organization’s structure, services, and mission, initially by attending an orientation/training session preceding the Annual Education Conference (on Monday, April 8, 2019 (1:00 - 5:00 pm) and Tuesday, April 9, 2019 (8:00 - 11:30 am) led by Officers, Directors, and senior staff, and also through ongoing work with the Directors to ensure the Board is aware of regional concerns and in turn, that Board actions are conveyed to the region. Develop leadership skills by interacting with city group and consortia within the region and reaching out to underserved areas within the region. Enhance public speaking skills in presiding over the regional business meeting at the Annual Education Conference, hosting regional conference calls, and taking advantage of other opportunities to share NALP information and data. Conduct outreach to new NALP members in the region; build new and strengthen existing professional relationships with a broad spectrum of colleagues in the region. Enhance writing skills through opportunities to write articles for the NALP Bulletin, announcements for NALPNow! and NALPconnect, and blog entries for NALPcomments!